THE EXPANSION OF OAKLAND INTERNATIONAL AIRPORT’S INTERNATIONAL ARRIVALS BUILDING IS AMONG THE ONGOING OAKLAND PORT PROJECTS: Another is the building of a 280,000-square-foot refrigerated seaport warehouse. Major developments are underway at the Port of Oakland that provide construction and warehouse jobs. 60 percent of 542 construction jobs on Oakland rail yard project went to local workers. Industrial development will soon create hundreds of new jobs at the Port of Oakland. The challenge: finding enough skilled workers to fill them. That was the message port officials delivered to a visiting delegation from the philanthropic Kellogg Foundation. The port said it wants to fill the skills gap with training for job candidates. It added that its aim is to put more local people to work. Officials from Battle Creek, Michigan-based Kellogg Foundation, along with some foundation grant recipients, traveled to Oakland to learn how the port creates jobs for underserved populations. 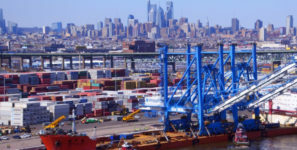 Among the ways discussed by port officials: project labor agreements that establish local-hiring goals and workforce development funding for capital construction projects; using project dollars to pay for job training to create a local workforce pipeline; and partnerships with developers and contractors interested in putting local residents to work. The port said major developments are underway that provide jobs ranging from construction to warehouse operations, including the expansion of Oakland International Airport’s International Arrivals Building and a 280,000-square-foot refrigerated seaport warehouse. A just-completed rail yard provided 542 construction jobs, said Tharpe. She said 60 percent of those jobs went to local workers. Driscoll said employers are searching for workers with skills such as truck driving or forklift operation. “We don’t have a good base of fundamental skills,” he said. Tharpe said the port assists local agencies that train workers for skilled blue-collar jobs. She said developers pay into a job-development fund 30 cents for every employee-hour worked on a port project. About 73,000 jobs depend on the Port of Oakland, Tharpe said, adding that workers in the San Francisco East Bay where the port is located fill two-thirds of those jobs.